The Cover: this week’s cover (titled “Welcome to Congress”) by Barry Blitt was mentioned here last week (it was released early). It received a bit of media attention. One example: this Huffington Post piece. 13 cartoons this week. 19 illustrations, with 5 of them full page. Two items of note in the list of cartoonists: a joint effort by Mick Stevens and Jenny Allen. And, unless I’m mistaken, Lonnie Millsap is making his debut in the magazine. If that’s accurate (someone please advise if it’s not) he is the 9th new cartoonist this year, and the 21st since Emma Allen was appointed the magazine’s cartoon editor in the Spring of 2017. … here’s Liza Donnelly’s Veterans Day animation for CBS News . 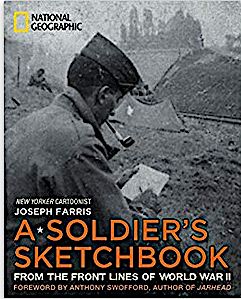 …this is a good day to recall A Soldier’s Sketchbook by the late New Yorker cartoonist Joe Farris. Published in 2011 by National Geographic, the book is available online at the usual places.